George Ezra: "My life was changing but, subconsciously, I was battling that." "Every gig I ever play, I promise myself I'm going to be the cool pop star," says George Ezra. "But I'm just not that person. After two songs, I'm grinning from ear to ear. "That grin is infectious. When Ezra played in London earlier this week, the whole room lit up with smiles as the audience gleefully sang back every word of his bouncy, ebullient pop songs.But the 24-year-old's easygoing style doesn't win him any favours with critics. The Guardian dismissed his new album, Staying At Tamara's, as "unchallenging" and "unflinchingly polite" - an assessment built on the myth that music's only worthwhile if it's edgy or miserable. George Ezra performs Paradise and a gospel-inspired cover of Rudimental's These Days in Radio 1's Live Lounge. That approach has worked in his favour. Staying At Tamara's is the fastest-selling album so far this year, swooping into the number one slot last weekend, just as Ezra set off on tour.The album is "about escaping and dreaming and taking yourself away", he told the audience at Brixton Academy, dressed in the same black T-shirt, and drinking from the same reusable coffee cup he'd been using during our interview five hours earlier.Like his multi-platinum debut Wanted On Voyage, the new record was inspired by travelling. Travelling to the Isle of Skye, a pig farm in Norfolk, a converted cow shed in north Wales and, rather more glamorously, an AirBnb in Barcelona, owned by the Tamara of the title. After his sound-check, the star told us about coming to terms with fame, why he'll never try karaoke, and performing on Ant McPartlin's last episode of Saturday Night Takeaway. Tell me about Tamara. Did she know who you were when you arrived to stay at her house?She hadn't a clue!So at what point did you go, "Actually, I'm a musician? "The thing is, she loved music but it was quite obscure music - to me at least. One night it was me and her in her room - a bit of red wine, and we had Spotify on, and she said, "You've got a guitar, do you play at all?" I was a bit sheepish, I tried to deflect it, but then she went, "Do you have anything on Spotify?" and I was like, "OK, here we are. Either I lie, or I tell her. "So you said, "Well, my name is Chris Martin. "Haha, yeah! I actually had to help her spell George Ezra. And that would have been fine, but then Budapest alone has had something like 300 million plays, and that's insane. She looked at me as if to say, "What the what?! "She was thinking, "I'm not charging you enough for this room."Exactly. "Can we re-evaluate the contract? ".And then another girl who was staying there as a guest stormed in and went, "I knew it was you! "From that moment on, every night that girl would be like, "When are you going to play for us?". I didn't do it. I managed to get out of it.What was it about Barcelona that was so inspirational?At a basic level, I just worked out what I was experiencing in my own head. My life was changing but, subconsciously, I was battling that. I can only say this now - I didn't know it at the time - but to interact with fans was to admit that there were fans, And to admit there were fans was to admit that I wasn't just George from Hertford - and I didn't want that. So there was that element of taking in everything that happened and realising, "OK, it's not a bad thing at all, you're not in a bad place, it's a really good situation". Both of your albums have been written on holiday. Why can't you write productively at home?I love community and I love my home town. My front door is quite literally open. I love people just swinging by. Nothing makes me happier than that - but it's a huge distraction. If your friend's clocked off early, they'll pop round at one o'clock and you go, quite harmlessly, "I haven't seen you in a while, let's go for lunch". And then lunch turns into last orders at the bar!Are all the love songs on the record about the same person? Yes. Three months or four months before the last record was completely wrapped up, I met my now-girlfriend. The timing was brilliant because we actually got to spend time together and go on a few dates. That was the one blessing about it taking me so long to write this bloody record! Did you really, as the lyrics to Sugarcoat suggest, "get to know each other better on a trampoline"?I love that song because it pretty much does explain a trip [we took] through South Africa.I never want to do big grand gestures of love and stuff in public - but also, I learned on this record you have to be honest with yourself. I'm well aware there's been one or two love songs written in the past, but I thought I'd throw a few more in there! You're a week into your tour. How has it been going? I'm the happiest I've been in a long time. Last year, we did a lot of shows but they were all festivals. And the issue with that is, festivals are not your audience. Once you're playing to your own audience, you really feel like, "Oh yeah! "I noticed that with Ed Sheeran's set at Glastonbury last year. He seemed thrown by playing to a crowd who weren't fully paid-up Ed Sheeran fans.I get it a lot. You're get an audience that are smiling back at you and singing every word, but you're looking at the dad in the corner that doesn't want to be there, or the boyfriend that's been dragged along. And for the whole gig you're like, "What do I have to do to make you smile?" Could that be a good thing if it makes you work harder?Yeah, but it's also not healthy. I have to go, "No, George. Snap out of it." And now what I do instead is I find the person that's singing along the most and I just watch them. I'm like, "The gig's for you! "How have you changed as a performer since the first record?I'm focusing on making it a performance rather than a gig. I mean, it is a gig. People won't forget that. It still smells like Brixton Academy. But it's more about how you make it "a show". I'm not the kind of act that thinks more time on stage is better. There are very few acts I want to watch more than an hour of. That probably says more about my attention span - but it's not about adding more, more, more. It's about making it more interesting. You said earlier you weren't a cool pop star - but you recently did the coolest thing its possible for a pop star to do.Really? What's that?You read a CBeebies bedtime story!Oh yeah! I was so nervous. The most nervous I've ever been.One thing I loved on the first record was I had a lot of primary school teachers saying, "It's the record we put on for the kids in the morning", so that was amazing. Genuinely.Do you get to choose the story?No, they gave me a selection and Sam, who looks after my TV bookings, said, "You have to do Kitchen Disco because it's my niece's favourite". Talking about TV - you were on the last episode of Saturday Night Takeaway before Ant McPartlin's drink driving arrest. Were you as surprised as everyone else the next day?Definitely. My experience there - and I'm not just saying this - was that I've not done a TV appearance that was so much fun. More importantly, I've never done a TV [show] where the atmosphere on set throughout the day was just brilliant. I'm convinced that that only happens if the people at the top are warm and welcoming. So my experience is that they're both lovely and couldn't have been warmer towards me so, yeah, I was shocked. I just hope everyone involved is all right.You've released a few videos where you're singing songs from this album in a karaoke bar. What's your go-to song on a night out?I've never done karaoke! It's a busman's holiday, isn't it? Because if I get up, either people go, "Yeah, alright mate, we know you sing" or they're gonna go, "Eugh, he's not very good".I think the funniest thing would be to do Budapest. I saw a video of Damon Albarn doing one of Blur's songs in Hong Kong. I think that's the way to go. But I hope I never have to do it. It really scares me. Staying At Tamara's is out now. 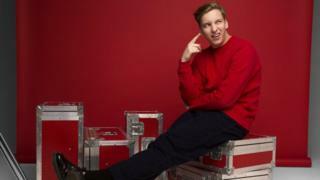 George Ezra plays the BBC's Biggest Weekend in Swansea this May.